Hunter Douglas versatile Silhouette® window shadings, with the Signature S-Vane™, are constructed with soft fabric vanes suspended between two sheer fabric facings and offer a wide selection of elegant fabrics and optional features. The suspended vanes tilt with precision, giving total light control and privacy. When fully raised, Hunter Douglas Silhouette window shadings completely disappear into the Pallette® fabric-covered head rail for an unobstructed view. This innovative window covering is available in two-inch, three-inch and the QuartetteT four-inch vane size. 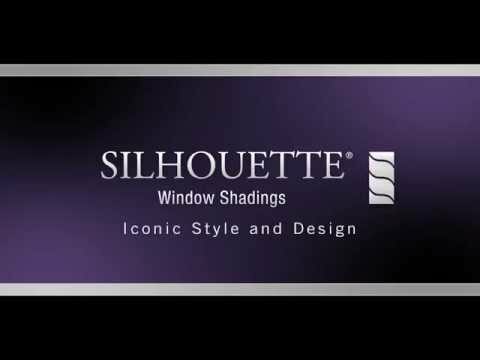 In addition, Silhouette window shadings are offered in four distinct lifting systems. Hunter Douglas’ elegant Alustra® Silhouette® window shadings combine the softness, beauty and light diffusion of sheers with functional fabric vanes for total light control and privacy. The vanes are suspended between two sheer fabric facings that completely disappear into the headrail when fully raised. Unique Sheers – Hunter Douglas’ exclusive sheer fabrics for Alustra Silhouette window shading transforms ordinary sunlight into remarkable beauty. Choose the Gold Radiance sheers to create a warm, luminous glow, Silver Reflection sheers for a subdued, sophisticated ambiance, or Voyant sheers for a textured, casual elegance. Distinctive Finishes – Hunter Douglas’ Gold Radiance and Silver Reflection hardware finishes for Silhouette windows shadings, add a distinctive accent to elevate the style of any room and offer the perfect opportunity to coordinate window fashions with gold and silver decor throughout the home.